Another Earth meets Perks of Being a Wallflower in this thoughtful, mesemerizing debut and subject of a TedX talk about the discovery of a mirror planet to Earth and how it dramatically changes the course of one Indian-American girl's junior year. “[O]ne of the most powerful reads of the year. 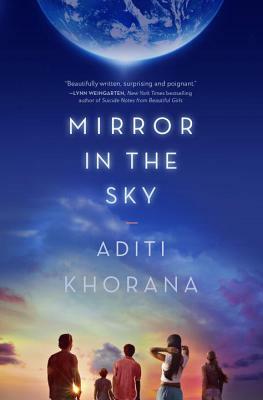 A novel about family, race, and discovering who you are, Mirror in the Sky promises a unique read that blends YA contemporary struggles with imaginative science fiction." Aditi Khorana spent part of her childhood in India, Denmark, and New England. She has a BA in international relations from Brown University and an MA in global media and communications from the Annenberg School for Communication. She has worked as a journalist at ABC News, CNN, and PBS, and most recently as a marketing executive consulting for various Hollywood studios including Fox, Paramount, and Sony. Mirror in the Sky is her first novel. She lives in Los Angeles and spends her free time reading, hiking, and exploring LA's eclectic and wonderful architecture. For more information, visit aditikhorana.com. "The true strength of the book is in Tara's observations of the little societies she must navigate, and the very real pain that comes from hiding your true self from the people around you." "Khorana perfectly captures the excruciating pain of a high-school society divided by race and socioeconomic status [...] Tara herself is a flawed, multidimensional character, and her empathy towards fellow students and her own mother’s desertion is beautifully drawn." "This thoughtful science fiction novel offers an emotionally and psychologically driven alternative to the recent spate of action-packed, alien-ridden sci-fi adventures. Khorana uses her sci-fi premise to explore the angst and excitement of possibilities, crafting a story with a deeply personal, potently adolescent vibe. Realism fans will welcome the academically gifted but socially awkward Tara and her more ordinary woes, while science fiction readers will appreciate the novel’s use of interplanetary drama to raise philosophical questions. A strong readalike for Wallach’s We All Looked Up, this novel is the perfect fit for readers prone to introspection and those looking for more than just the next fast-paced page-turner." "The writing style is eloquent, and the characters are well developed, particularly Tara, who is struggling as the only Indian girl in an all-white school. Will appeal to readers who enjoy realistic fiction with a splash of sci-fi." "In her thought-provoking debut, Aditi Khorana brilliantly blends the speculative with the contemporary. What results is a story full of layers, and rich with characters so engaging and complex I continued to think about them long after I turned the final page."